Operating E/P derives from corporate earnings sources expected by management to continue contributing to future earnings. As-reported E/P includes contributions to earnings from discontinued operations and anomalous (as judged by management) conditions. Operating earnings are arguably more forward-looking and optimistic. As-reported earnings are arguably more manipulation-free and realistic (sustainable). This is an in-sample view. An investor operating in real time would not know the average during the sample period. Stock buybacks began augmenting/displacing dividends in the mid-1980s. 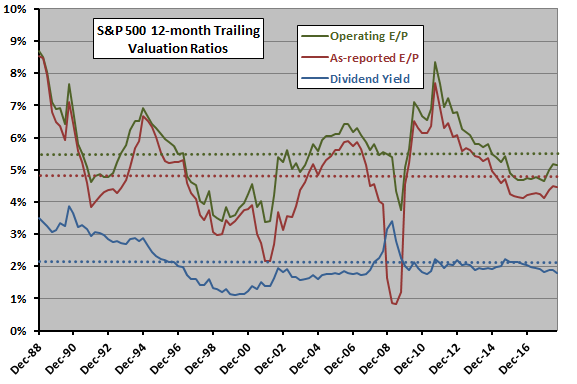 The next chart is a shorter-term view of 12-month trailing operating E/P for December 2008 through September 2018. 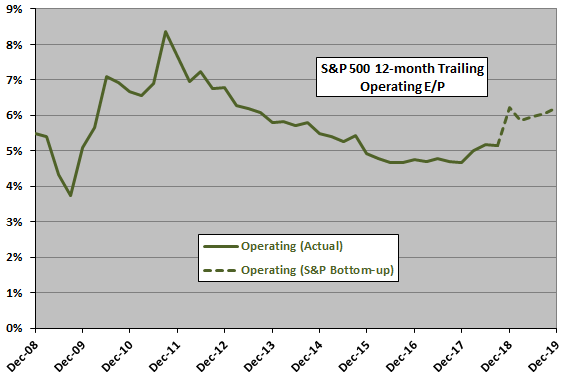 The chart also shows the trajectory of operating E/P for the current Standard & Poor’s bottom-up operating earnings forecast through December 2019 (dashed line), assuming the S&P 500 Index persists near its end-of-January level of 2704. If the Standard & Poor’s earnings forecast is accurate and the S&P 500 Index remains near this level, 12-month trailing operating E/P will rise back above its 30-year average of 5.54% as shown in the chart above. The final chart presents a shorter-term view of 12-month trailing as-reported E/P for December 2008 through September 2018. 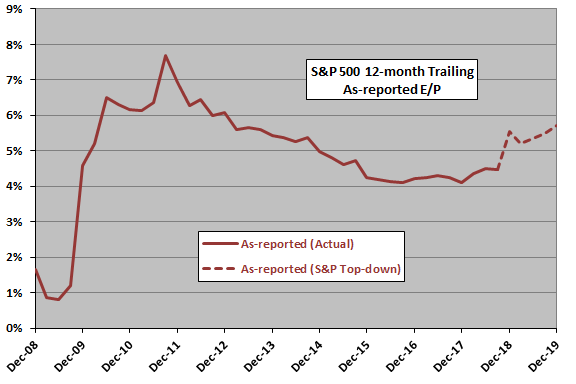 The chart also shows the trajectory of as-reported E/P for the current Standard & Poor’s top-down as-reported earnings forecast through December 2019 (dashed line), assuming the S&P 500 Index persists near its end-of-January level of 2704. If the Standard & Poor’s earnings forecast is accurate and the S&P 500 Index remains near this level, 12-month trailing as-reported E/P will rise back above its 30-year average of 4.80% shown in the top chart above. In summary, current S&P 500 earnings forecasts indicate 12-month trailing earnings-price ratios rising from below to above generational “normal” over the next year. The sample period may not be long enough to generate averages representative of a very broad range of economic/market conditions. E/P distributions may not be tame, and the average historical E/P may therefore not be a reliable estimate of future E/P.